Oil – Oil is trading in the middle of the range that it has been in since May. The top of the range has been around $50 and the lower side has been around $45.50. 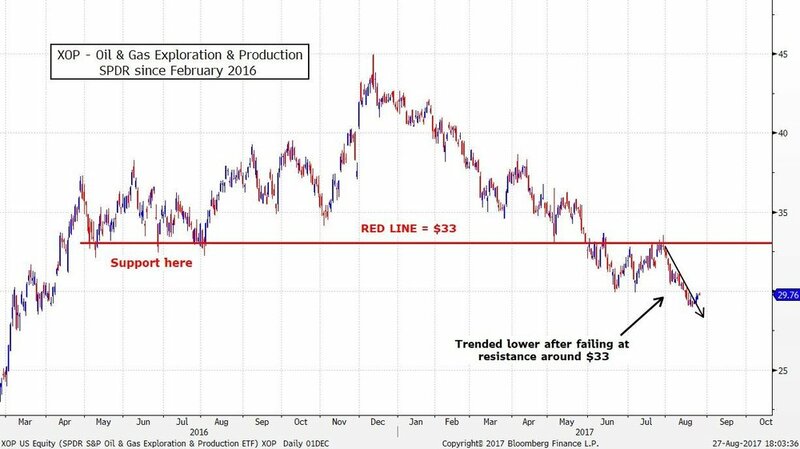 Longer-term there is support around $43. There was support there last September, November, and again in June. The levels around $50-51 have been important resistance for almost two years and they probably continue to be, at least in the short-term. 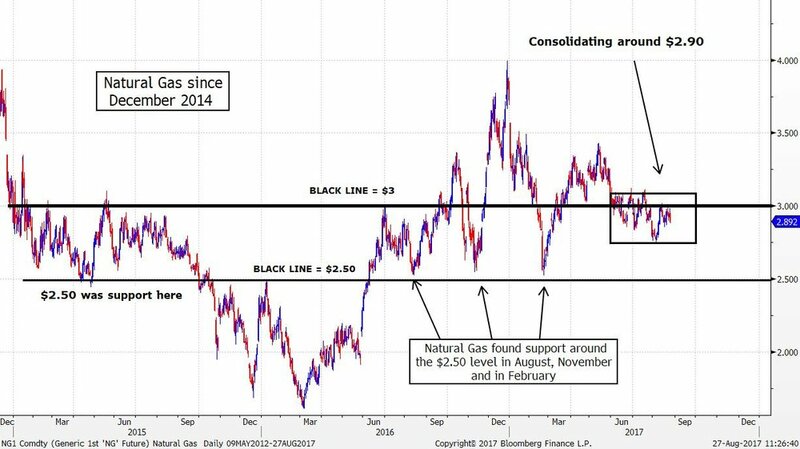 Natural Gas – Natural Gas continues to consolidate just above the $2.90 level. This level has been the middle of the range since early June. Longer-term, if it trades down to the $2.50 level there will probably be support there again. It was support during last August, November, and December. It was also support in early 2015, and important resistance in January of 2016. 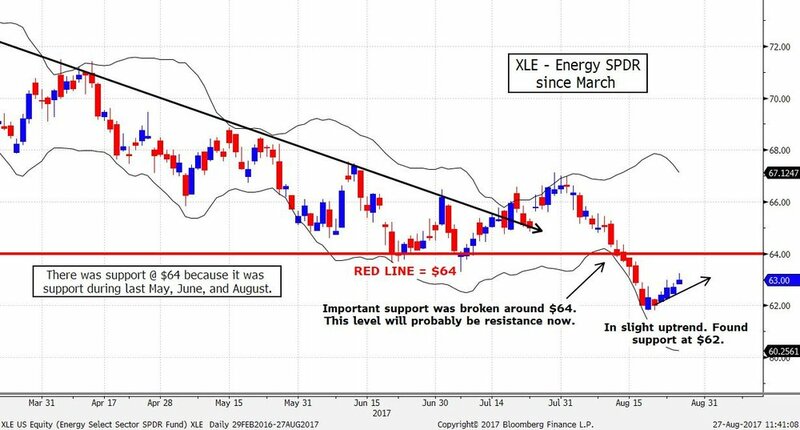 XLE – S&P 500 Energy Sector ETF - The XLEs recently broke important support around the $64 level. There was support at this level during last May, June, and August of 2016, and then again in early June. It will now probably become an important resistance level. Recently, they found support around $62 and are in a slight uptrend. 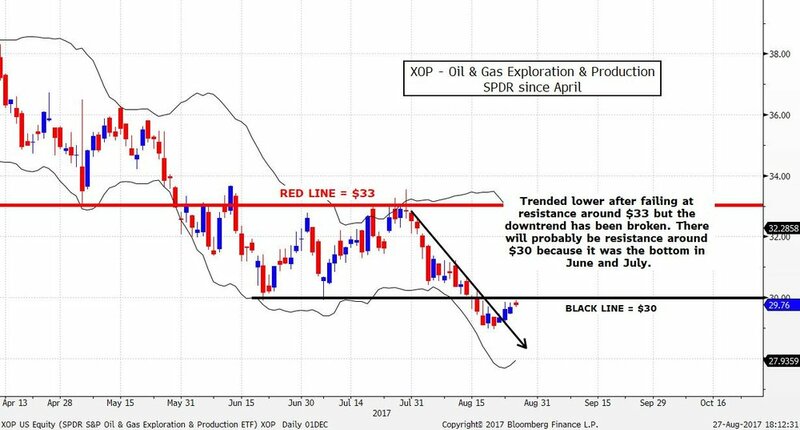 XOP – S&P 500 Oil & Gas Exploration & Production ETF - The XOPs have trended lower since failing at resistance around the $33 level in late July. 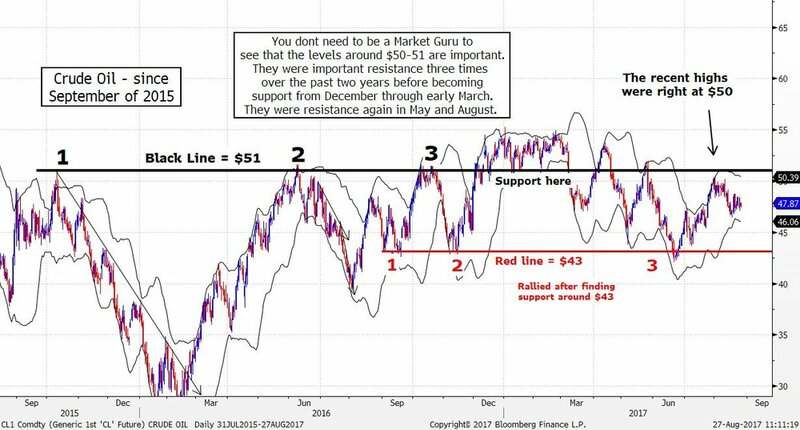 There is resistance at this level because it was support from last April through August of 2016. If they rally, there will probably be resistance there again. Over the past few days, they have broken the downtrend. Shorter-term, there will probably be resistance around the $30 level because it was the bottom in June and July. 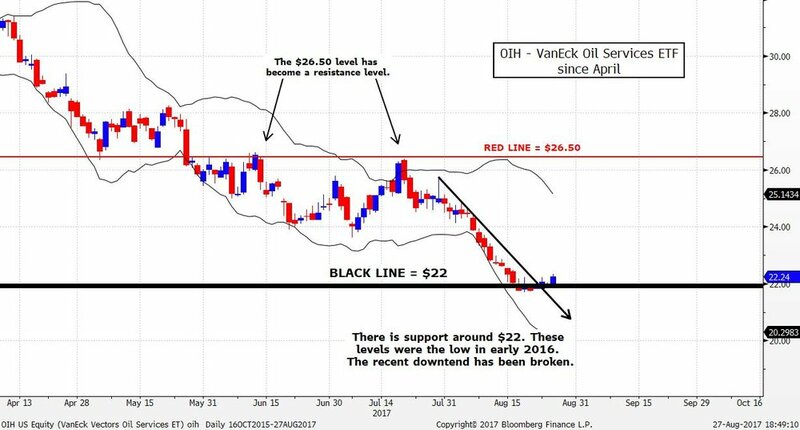 OIH – VanEck Vectors Oil Services ETF - The OIHs have trended lower since failing at resistance around the $26.50 level in late July. As expected, there was resistance there because it was resistance in June and support from April through November of 2016. They have broken their downtrend after finding support around the $22 level. This level is where the lows were in early 2016. AMLP - Alerian MLP ETF Shorter-term - The AMLPs sold off sharply after failing at resistance around the $12 level in early August. This level was support during last June, September, November, and December, and was resistance from the end of June through August 3rd. They have broken their recent downtrend and are testing short-term resistance at $11. This level was the bottom in mid-June. IXC – iShares Global Energy ETF - The IXCs broke their recent downtrend after finding support around the $30.50 level. There was support at this level because it was support in June and July as well. If they continue to rally they will probably run into resistance again around the $32 level. There is resistance at this level because it was support during last November and again from March through June. KOL – VanEck Vectors Coal ETF - The KOLs gapped up after breaking resistance around the $14.60 level. They are now overbought. If they sell off or consolidate there will probably be support around this level. 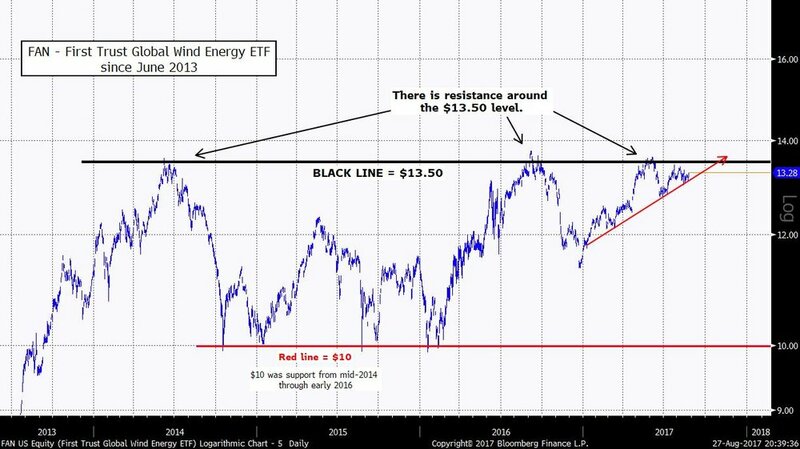 FAN – First Trust Global Wind Energy ETF - The FANs are consolidating just under resistance around the $13.50 level but they are still in the uptrend that began late last year. This level was also resistance last August and September, and in June of 2014. Each time was followed by a significant selloff. There isn’t clearly defined support until they approach the $12 level. 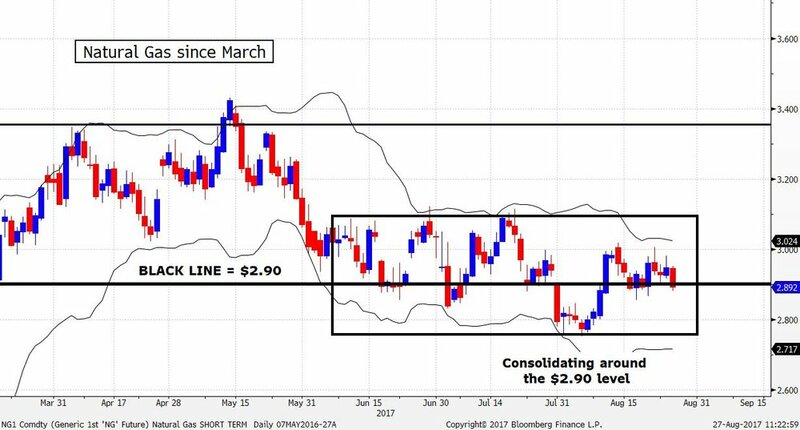 TAN – Guggenheim Solar ETF - The TANs have been consolidating since running into resistance around the $22 level and breaking the uptrend that began in June. There is resistance around the $22 level because there was resistance there last year from May through August.